In the industry of steel structure design, builders and customers alike are always on the lookout for the best products available. As long as the steel connection meets safety standards, consumers are open to a wide range of strategies for enhancing aesthetic and structural stability while keeping costs stable. It is important to remember that every project is unique, creating unexpected changes and setbacks that require calm and expertise for the best results. Sanilac Steel is proud to be your trusted team of Structural Steel Fabricators in Michigan, delivering safe, honest, and reliable results that help to get your project completed on time and on budget. Since 1967, the Sanilac team has delivered personalized attention and efficient results for a wide range of design demands. We have a deep understanding of what goes into the making of a structure, which involves two crucial elements — welds and bolts. There is much debate about which application is better for industry professionals and DIYers alike. Today, we’ll go into depth on a few considerations of each strategy. Once you have caught up on our conclusion, be sure to contact us to receive an accurate quote for your project! Depending on how you look at it, either application can hold the title for most convenient. Bolting can be handy for the sake of convenience, as two pieces can easily be formed together and taken apart at will. Welding, on the other hand, provides a permanent seal between two objects that cannot easily be disassembled. Also keep in mind that bolting can be done between different materials for added versatility. In some applications, the welding process will prove more convenient when a hermetic seal is required. Bolted applications can provide the required pressure to seal out air and moisture, but an actual seal will be required for an airtight outcome. Additionally, numerous bolt points will be needed for the best results. Welding, on the other hand, can prove convenient in properly sealing any joints without the extra labor or parts. While a mobile welding service may sound like a convenient solution for many project needs, it’s important to remember that the quality of your project will depend heavily on the team fabricating and erecting the structure. Proponents of bolt-on applications will inform you that each part is created under precise conditions, resulting in a perfect fit that is sure to work on the first try. The electrode quality. A core wire is used to conduct a current to the arc to melt down the metals at the atomic level. If this device is not working properly or is not covered correctly, the quality of your weld can diminish. The welder’s skill. 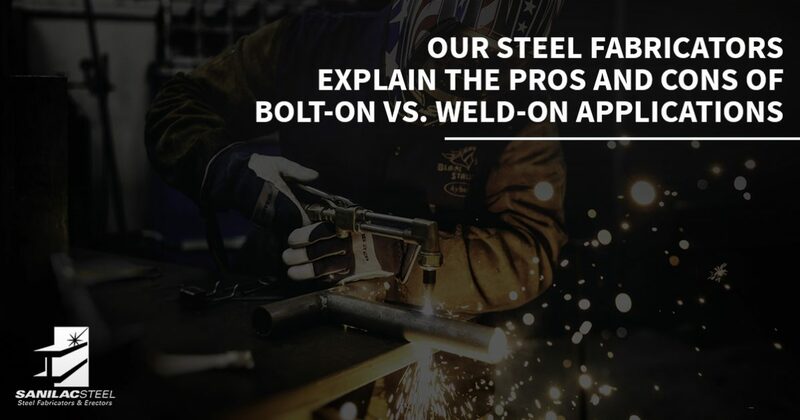 Ultimately, the precision and efficiency of your weld will depend on your contractor’s experience and skill level. Our steel fabrication company strives to ensure the best results for each of our clients. Power tools are man’s best friend when it comes to installing bolts and fasteners on an industrial level. Our steel contractors are experienced in providing fast and effective outcomes for projects where bolting is the best solution. Keep in mind, though, that the assembly process for welding is often simpler, resulting in faster results that can help to enhance the longevity and support of a wide variety of structures. A skilled individual can cover a lot of ground in the time it takes to fully complete a bolting project. 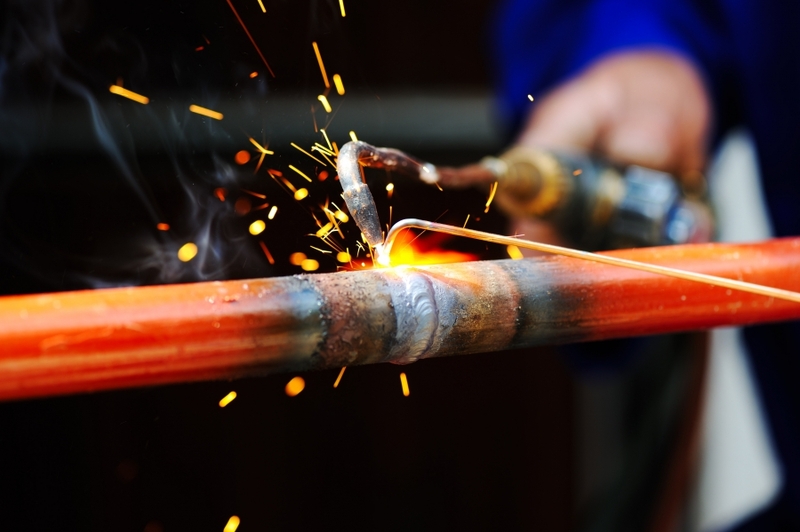 One key advantage to welding is its ability to distribute stress effectively along joints or repairs. In all, you’ll have one continuous joint that lowers any points of concentrated stress. Bolting is a fast and convenient method for adherence, yet the design of the structure results in more intense stress points along the joint. Keep in mind that different applications will yield different results, so be sure to speak with your designers and structural steel fabricators for the best approach. There are many measures available to enhance the steadfastness of any bolts used in structural steel design. Jam nuts, locking nuts, Loctite, and other fasteners all provide extra protection against being jarred or vibrated loose. If this occurs, serious structural failures are possible! Conversely, welding is a much more effective way to create long-term solutions for joints in structural steel fabrication and installation processes. The simplest way to explain this is to tell you that welding works to rearrange the atoms of similar materials to create a single surface between two planes. These atoms move about fast enough and combine, sharing a common connection with the new elements. The result is a connection that is stronger, longer lasting, and able to withstand a wide range of stressors. Ultimately, our steel fabrication company relies on both methods to provide comprehensive solutions for optimized safety and longevity in steel structure design. Bolts provide functionality across a wide range of uses, delivering versatility and precision when needed. Welding serves to provide more durable results that are stronger and more resilient to the world around us. Our structural steel fabrications help Michigan clients on projects of all sizes. If you’re searching for a company that can provide comprehensive steel services from the design process to opening day, Sanilac Steel is here to deliver. We provide quality results in an honest, safe, and reliable manner that serves to enhance the outcome for your job. Contact us today for a speedy quote or to learn more about our services!